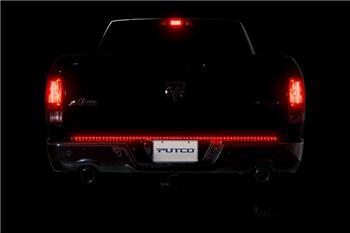 Putco Tailgate Light Bar - Dezod Motorsports Inc - Home of the automotive performance enthusiast since 2002. Installs in minutes using supplied 3M tape or mounting screws for a secure installation! Can be used with towing/hitch packages – no wiring required if you have a hitch! Wiring is a breeze – color-coded instructions will help you through the entire process! Available in a white/red (brakes, running lights, reverse lights, blinker lights). Adds the Big Truck look to your truck! Turns heads! LED bulbs are bright and long-lasting! Featuring a Patented Clip Mount system which makes the bar removeable and easy to install, IPF 68 Waterproof Rating.